For some reason I can't find my photo of the complete soup sent to me by my wonderful partner, Sierra Barrett over at http://giraffecanhas.wordpress.com/, I will post it as soon as I find it, but here is my Bead Soup Reveal! Sierra sent me some really interesting pieces to work with that were not my usual thing at all, so I decided to create something different than my usual style. No seed beads involved at all! I went back and forth about making this a necklace or whether to turn this into a freestanding sculpture. I originally wanted to see the vase like focal pouring out something, either as a fountain into a river with trees in the fall dropping leaves into the river. But then I also wanted something I could wear. So I merged the ideas into something that would be wearable but more sculptural. All the beads came from my soup, the only thing I added was brass and copper wire twisted together. The pictures don't quite do this justice in terms of how beautiful these orange beads with the flecks of red are. This 8th annual Bead Soup Blog Hop has a LOT of participants. My thanks go out to Lori Anderson for arranging these fun exchanges. 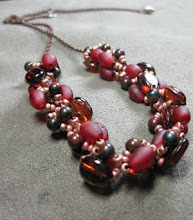 I encourage you to go take a look at her work and the full list of people participating over at the Bead Soup Blog Party. Great reveal. That is something I would expect a woodland fairy to be wearing. I love the colors in it. Great job! Very lovely! What a statement piece! Sculptural indeed!! It really does look like that is pouring out of the vase, very cool and nicely done! That is a fabulous statement necklace. Excellent use of your soup. Shiraz, this is an awesome creation, very dramatic and lyrical. You will be proud to wear this! Now, thats an eyecatch. Beautiful soup, Shiraz! Lovely necklace! Looks like fall when all those leaves are whirling around in the wind. Oh that is wonderful! All those leaves and orange colours pouring out of the 'vase' focal as if the vase is pouring out the winds of autumn. Really beautiful and inspired piece. Very unique and creative idea. Oh that is so cool! What an airy creation -- like a fairy web or something. Great job! Oh my goodness, your necklace is awesome! Great job! What an interesting and marvellous wirework you made! The necklace is so different and gorgeous!!! this wire composition is really amazing!! Shiraz your necklace is fabulous. Truly a one of a kind work of art. It is one of the best pieces I have seen in this hop. Shiraz, what a fabulous job you did. I love the whole sculptural idea. I would love to see the water pouring out of the vessel theme next time:) Sounds interesting. I bet you will get tons of comments on this necklace. I love how the wire "flows" out of the vase focal. Very well thought out and an unusual and effective design. Nice work! This necklace is wonderful. It reminds me to falling leafs in autumn. Wow!! What a necklace ! very unique ! So very cool, absolutely love the necklace! It's an awesome piece, very unique, magical! Awesome concept and design! Very imaginative and well structured statement bib necklace! And I like how the support strand is beaded with chunkier beads all the way to the back to complete the statement look! I think maybe you should work outside your comfort zone on a regular basis, it certainly works well for you! Great soup! Good heavens but that's gorgeous! You always make such beautiful things.